(Trent Nelson | The Salt Lake Tribune) The Campaign for Smart Justice Project - Utah and the Alliance for a Better Utah Education Fund will host a debate in the race for Salt Lake County District Attorney with Democratic candidate Sim Gill, left, and Republican candidate Nathan Evershed, in Salt Lake City on Wednesday Oct. 3, 2018. 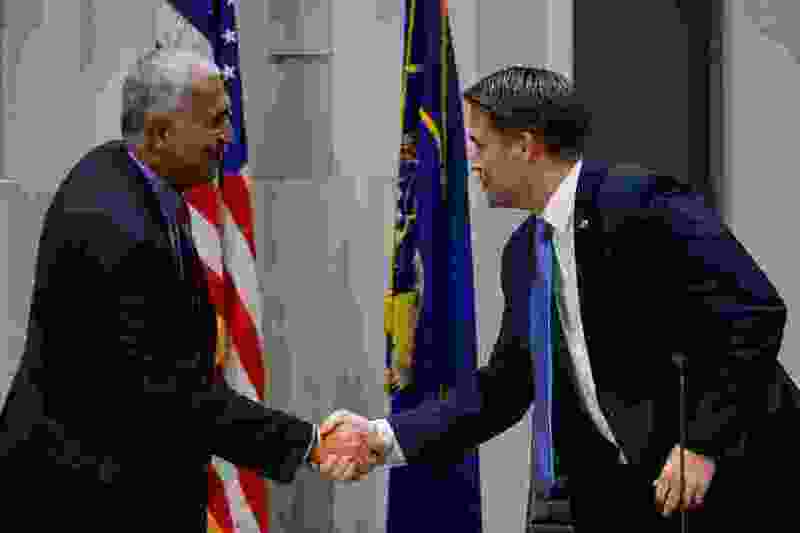 At the Salt Lake County district attorney debate on Wednesday evening, Republican candidate Nathan Evershed touted his experience as a career prosecutor and aimed to paint his opponent and boss, two-term incumbent Democrat Sim Gill, as an ineffective leader who puts politics above justice. 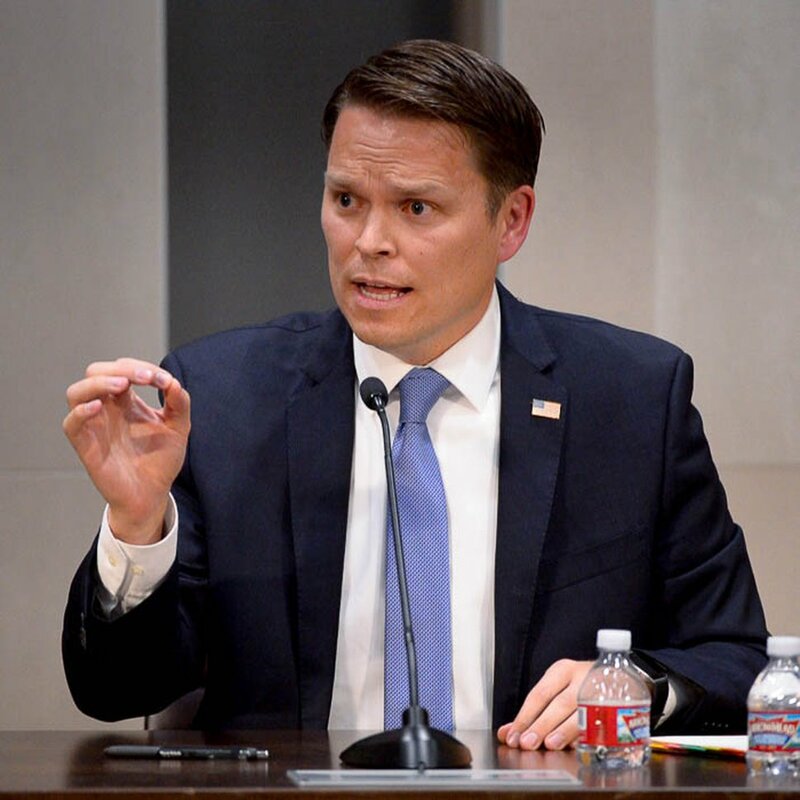 “I am running because the district attorney’s office is, at it stands now, broken, and I believe that I am qualified and prepared to fix it,” he said, arguing that the office has lost experienced attorneys and staff, the public’s trust and the respect of law enforcement under Gill’s leadership. Gill aimed to fend off attacks and position himself as the candidate with a proven track record of fiscal and social responsibility as well as with a broader focus and vision for the office needed as it works to address future criminal justice challenges. “As a prosecutor for more than 20 years, I’ve advocated for smart prosecution over zero tolerance, therapeutic justice over incarceration where appropriate, and jailing those who are a risk to our community than merely those suffering from disease of addiction and mental illness,” he said. 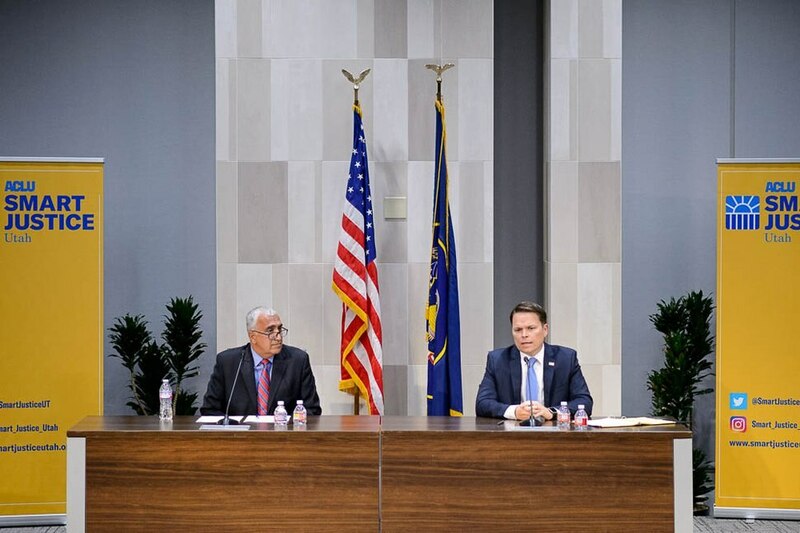 Before a full house in the University of Utah, the debate — which was organized by the ACLU and Alliance for a Better Utah — was energetic and, at times, heated, with a member of the audience interrupting Gill during one of his answers to make a point. The candidates sparred for an hour and a half on a range of issues, including the right approach to officer-involved shootings and views on a Utah ballot initiative that would legalize medical marijuana in the state. It’s been less than a week since Gill’s office declined to file charges against a Salt Lake City officer who fired his gun at a man fleeing officers into an occupied downtown office building. During his time in office, Gill has been criticized by advocacy groups for not pressing charges in a number of such shootings. But he argued Wednesday that his office has worked to improve procedures and transparency around these cases by establishing an objective, independent task force that ensures officers from the same police agency are not investigating their colleagues. Evershed criticized the length of time it’s taken Gill’s office to move forward on two officer-involved shootings — one that took 10 months, he said, and another that took over the year. (Trent Nelson | The Salt Lake Tribune) Nathan Evershed. The Campaign for Smart Justice Project - Utah and the Alliance for a Better Utah Education Fund will host a debate in the race for Salt Lake County District Attorney with Democratic candidate Sim Gill and Republican candidate Nathan Evershed, pictured, in Salt Lake City on Wednesday Oct. 3, 2018. On medical marijuana, Gill said he plans to support the ballot initiative after meeting firsthand with struggling patients. The Utah Sheriffs' Association has officially signed on to the coalition opposing Prop 2, as has Salt Lake County Sheriff Rosie Rivera, who has noted that law enforcement officers across the state see “some real issues” with enforcement surrounding legalization. 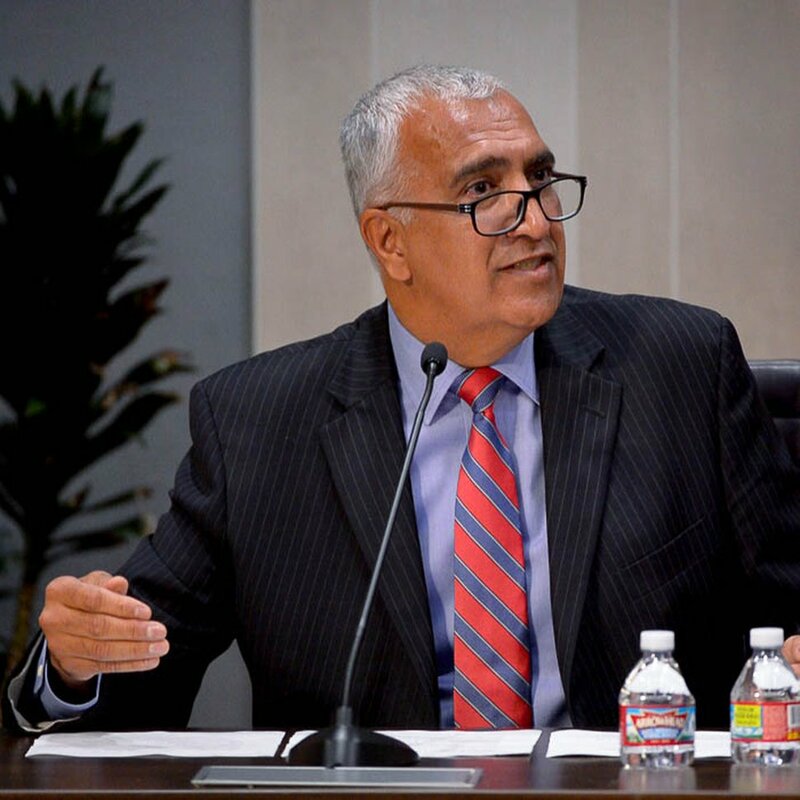 Evershed stressed that the district attorney’s role is to enforce the law and said he would support the will of the people, no matter their decision. But he said he won’t personally be supporting the ballot initiative because of flaws he sees in its language. But both agreed on one thing: That the need for a ballot initiative demonstrated a failure on the part of the Legislature to act and that the issue needs further conversation. “This is not perfect language but this was the only option that was left to our citizens when our Legislature failed to pay any attention to this,” Gill said.